Situated within a Class A building on Biscayne Boulevard and 208th Street this business center provides great on-demand workspace ranging from private office space to a variety of co-working access options. With a number of state of the art provisions and technological facilities offered on site as standard to all occupying tenants, this center is ideally placed to be the perfect corporate venue for ny type of business function or specific commercial requirement. Conveniently situated close to the many restaurants and shops at the Aventura Mall, leased space is offered in this fantastically landscaped location. This building offers well designed and fully furnished offices with excellent services offered. These suites can be rented on various time intervals and offer the latest technology, and meeting rooms. Leased office space now being offered at this Downtown location close to the beach and the I-95. Close to all major hotels and restaurants. This is a high grade building offering well designed office suites that really give a corporate image. The suites are strapped with all the modern technologies including VOIP and stationery / admin facilities, and personalized reception support. This is a serviced center based conveniently close to the I-95 and to the Turnpike with the Aventura Mall nearby and sport stadiums. This centre is well managed and includes fully furnished office suites with large windows, allowing natural light to cascade throughout the building, and is equipped with the latest in high-speed internet. On-site amenities include the use of kitchen and conference room facilities. This exquisitely furnished and technologically innovative business center offers serviced office space based in central Aventura, moments to restaurants, hotels and the I-95 and 595. This is also close to downtown Miami. These offices feature tall windows and with great views, the latest technology, well appointed offices and reception area. Also includes all round security access. Connected to communications ring with 100% redundancy and scalability. 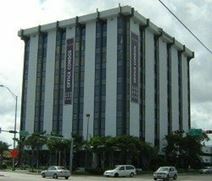 Situated in an iconic landmark building that benefits from a prominent business address in Aventura, Florida, this technologically powered private and shared flexible office space is customizable to suit the needs and requirements of your business and is the ideal setting for any type of corporate workspace requirement. The local transport links are also highly convenient, with frequent services operating throughout the area. Situated in Aventura Mall near to many fine restaurants, golf courses and county clubs, these offices offer a range of amenities. This centre features 2 conference rooms, and VOIP and high-speed network facilities, plasma TV, admin support, and bilingual services. The centre can be accessed 24/7 and offers the highest security. Virtual offices are also available can be used as an ideal business address anywhere in the world.